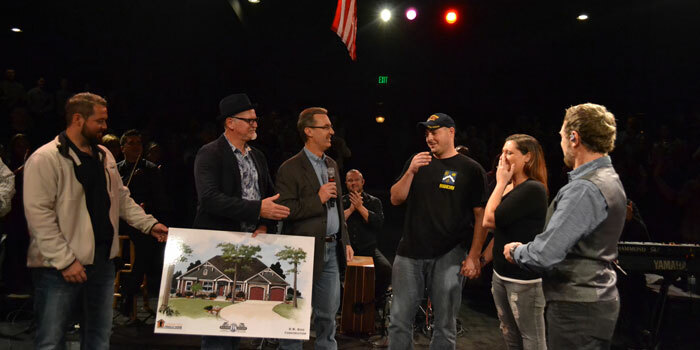 Veteran Justin Raymer, a Warsaw native, and his family were surprised at the Craig Morgan concert to learn they would be receiving a mortgage-free home in the Warsaw area, allowing them to finally come home. 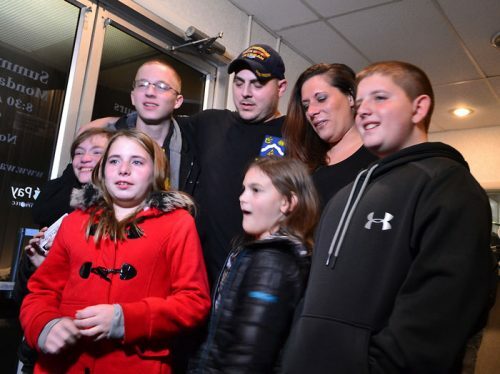 This evening, Saturday, Nov. 19, Justin Raymer — a Warsaw native and 2001 graduate of Warsaw Community High School — and his family received the surprise of a lifetime when it was announced they’d finally be able to return home to the Warsaw area from Georgia thanks to Operation Finally Home, the Builders Association of Kosciusko Fulton Counties and R.W. Kidd Construction. 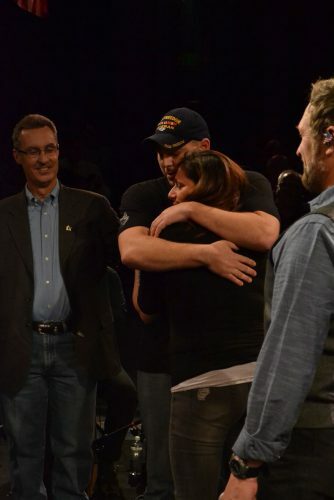 During Craig Morgan’s concert at the Wagon Wheel Center for the Arts, Justin and his wife, Kaci, were brought on stage and told they would be receiving a mortgage-free, custom-built home through Operation Finally Home, a national, nonprofit organization with a unique network of experienced builders, suppliers and supporters dedicated to building homes for wounded, ill or injured veterans, surviving spouses and their families. The home will be Operation Finally Home’s first project in Indiana. Raymer grew up in Warsaw and his father is the assistant fire chief for the Winona Lake Fire Department. He joined the Indiana National Guard in Warsaw in 2000 and was deployed to Iraq in 2002. He later entered active duty with the Army in 2006, with assignments in Germany, South Korea and Fort Benning, Ga. He was combat deployed two more times. Through his service, he earned the Combat Infantryman Badge and several other awards before he was medically retired on June 27, 2015. “We have wanted to come back,” said Raymer, noting, however, that they could not previously afford to do so. Kaci said the new home will be make a huge impact for their blended family of five kids — Michael, Dillon, Stella, Brooklyn and Katy — adding that the night of the concert was the first time the whole family has been together in four years. The lot where the home will be built has already been purchased, with the official groundbreaking ceremony expected to occur in March. The home is planned to be finished before the school year, so Raymer’s children will be able to easily attend school in the fall. Sarah Wright is a 2009 graduate of Purdue University, earning a degree in professional writing and minors in German and history. She has been with The Papers Inc. since June 2011.